Marine Engines Market size in 2017 was valued over USD 10 billion and is set to grow over 4% by 2024. Global marine engines market is set to witness an appreciable growth subject to growing trade activities and positive outlook toward maritime industry. In 2016, rise in container trade contributed over 23% of the global seaborne trade. According to a UNCTAD report, in 2016 world seaborne trade volumes expanded by 2.6% as compared to 1.8% in 2015. However, more than 80% of the seaborne trade majorly contributes to carbon emissions. 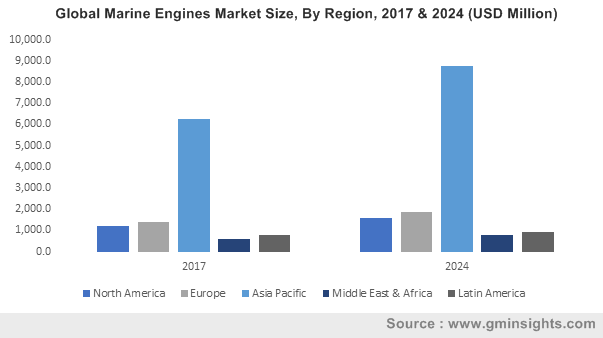 Expanding tourism industry driven by improvement in the standard of living, rise in disposable incomes, and demographic changes will stimulate the global marine engines market size. As per the World Travel & Tourism Council in 2016, maritime tourism was the highest revenue generating segment and accounted for 10.2% of the global GDP and generated USD 7.6 trillion. 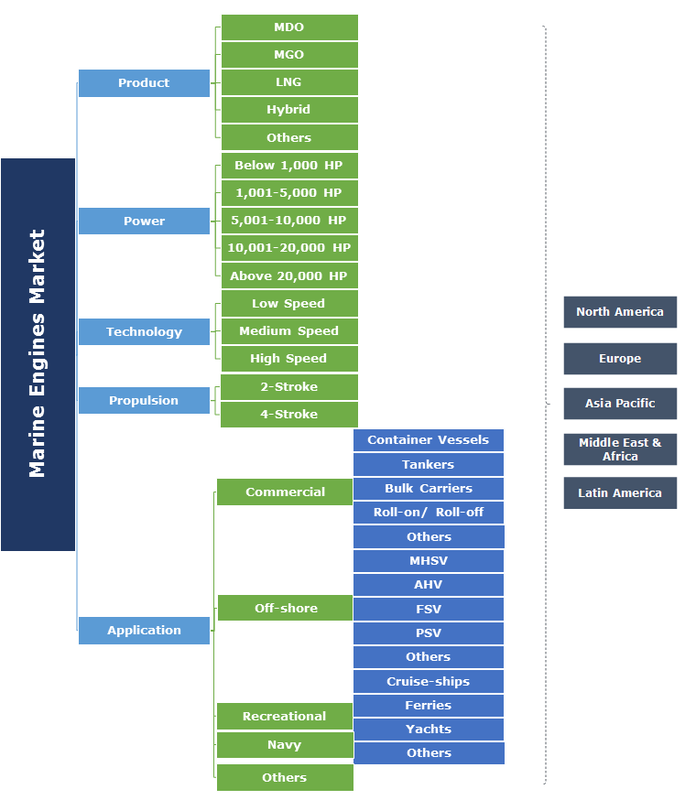 MGO marine engines market, in 2017 was valued over USD 1 Billion. Ability to generate the lowest concentration of sulfur & particulates in the fuel is one of the distinguishing features boosting the product demand. The introduction of norms by the International Maritime Organization (IMO) under the MARPOL Annex VI will further encourage the adoption of low emission units. Hybrid engines are anticipated to grow owing to the rising concerns toward the environmental protection and GHG emissions. Operational capabilities, low operating costs, high efficiency and reduced noise range are some key factors supporting the product demand. The paradigm shift by shipowners toward the adoption of eco-friendly fuel will further augment the business landscape. Rapid innovation in the propulsion products toward maximizing energy efficiency and power output will boost the 1,000 – 5,000 HP marine engines market. Focus on developing sustainable electric motors to reduce fossil fuel consumption will further stimulate the business growth. 10,000-20,000 HP marine engines market is anticipated to expand over 4% by 2024. These units are combined with exhaust-gas turbochargers and are deployed across the industry to match the efficient propeller speed without recourse to a speed reducing gear. Low speed, in 2017 accounted for over 25% of the global marine engines market share. Rise in global long voyage trade along with utilization of low-cost fuel will propel the industry landscape. The growing adoption of products in container vessels and merchant vessels will further strengthen the product demand. High speed engines will witness growth on account of ongoing construction and expansion of local seaports along with an increased demand for tugboats. Improved system performance and compact designing offered by the product will further favor the business scenario. Two-stroke are projected to expand over 4% by 2024. Technological advancements focused on improved operational efficiency to comply with the environmental regulations is set to escalate the product penetration. The units offer higher power at lower rotational speed and have thermal efficiency as high as over 50%. High fuel efficiency along with capability to generate relatively lower pollution will drive the four-stroke marine engines market. Reduced noise levels, faster development rate, and series production of products are some of the key factors supporting the product penetration. Recreational segment is set to exceed USD 2 Billion by 2024. Rise in disposable income along with improvement in living standards will stimulate the industry growth. Rising demand for luxury and comfort, resulting in an increased spending toward cruise ships will in turn propel the industry landscape. Commercial applications are predicted to grow on account of growing seaborne trade across the developing economies. The demographic shifts in the global urbanization coupled with the rising cross-border transport is further set to enhance the market share of these vessels. Asia Pacific, in 2017 accounted for over 60% of the global marine engines market. Presence of numerous manufacturers along with ongoing R&D ventures in product design will strengthen the industry outlook. An increasing maritime trade in South East Asia, primarily across China and Indonesia will further accelerate the business growth. The U.S. marine engines market will witness robust growth owing to positive outlook toward shale production and exploration along with ongoing technological advancements to manufacture clean units. In 2015, the country implemented IMO tier III norms to reduce the NOx emissions by limiting the use up to 0.5%. The ongoing retrofitting activities in shipping yards toward the installation of environment-friendly systems will further accelerate the product demand. Eminent industry players include Anglo Belgian, Brunswick Corporation, Caterpillar, Cummins, Daihatsu Diesel, Deutz, John Deere, Shanghai Diesel, MAN Diesel & Turbo, Rolls Royce, Scania, STX, Volvo Penta, IHI Corporation, Wärtsilä, Yanmar, Yamaha, Weichai, and Yuchai. Global vendors are focusing extensively on business expansion by developing strategies and strengthening their global reach. The companies are taking active interest in mergers and acquisitions with global and regional players with an aim to generate new market opportunities. These systems are the equipment that generate power for board vessels that operate on varied fuels including diesel oil, gas oil, LNG and hybrid. The wide acceptability of the systems by ship manufacturers owing to their compatibility with the requirements on vessels along with easy availability of fuel will positively influence the industry landscape.